Classic Movie Night at Soulcraft Martial Arts This Friday! 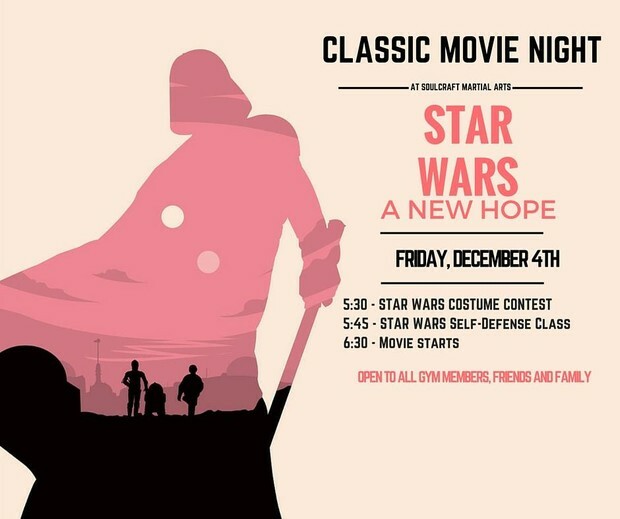 Join us on Friday, December 4th for a viewing of Star Wars IV: A New Hope; just two weeks before the release of the Force Awakens! This event is open to all Soulcraft Members, both children and adults. There will be a costume contest starting promptly at 5:30, followed by a Star Wars Self-Defense class from 5:45 to 6:30. The movie will officially start at 6:30.